The building Vera - Luxury Apartments starts this season its sail in the tourism industry. It is a newly stone building (2013 - 2014) which was based on traditional manufacturing standards of Lefkada. Divided into two independent villas (maisonettes), with the names Nana and Joanna. The building is in a fenced private area and is surrounded by a wooded environment. Owns hillside location and offers panoramic views of the Ionian Sea and the sunset. Villas harmoniously combine mountain and sea, green and blue and are a wonderful choice for a quiet and unforgettable holiday. 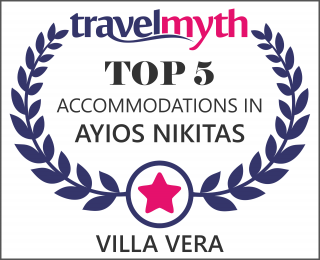 They are in a great location in the West coast of Lefkada, in the area of Shigi Exanthia. Refrain 2.3 km. from the famous beach Kathisma (three by car) and 3,5 km. from the famous tourist destination, Agios Nikitas (5 by car). It seats 100sqm and spans two floors. With four beds and one double bed can accommodate up to six (6) people. It seats 100sqm and spans two floors. With five single beds and one double bed can accommodate up to seven (7) people.